Ribosomes churn out new proteins within a cell and are, themselves, intricate blends of RNA and protein. 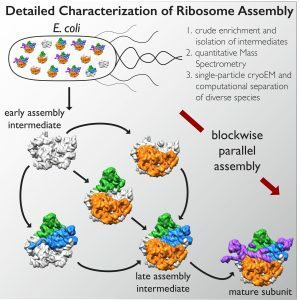 A multi-institutional collaboration has now solved the structure of a crucial piece of the ribosome as it assembles. This new study shows that it will be possible to examine other large, dynamic molecules with new high-resolution imaging methods. LA JOLLA—Ribosomes—macromolecular machines consisting of RNA and proteins that twist, fold and turn—are responsible for making all of the protein within a cell and could hold the key to deciphering a range of diseases. Despite the intricacies of ribosomes, cells are able to churn out 100,000 of them every hour. But because they assemble so speedily, researchers haven’t been able to figure out how they come together. 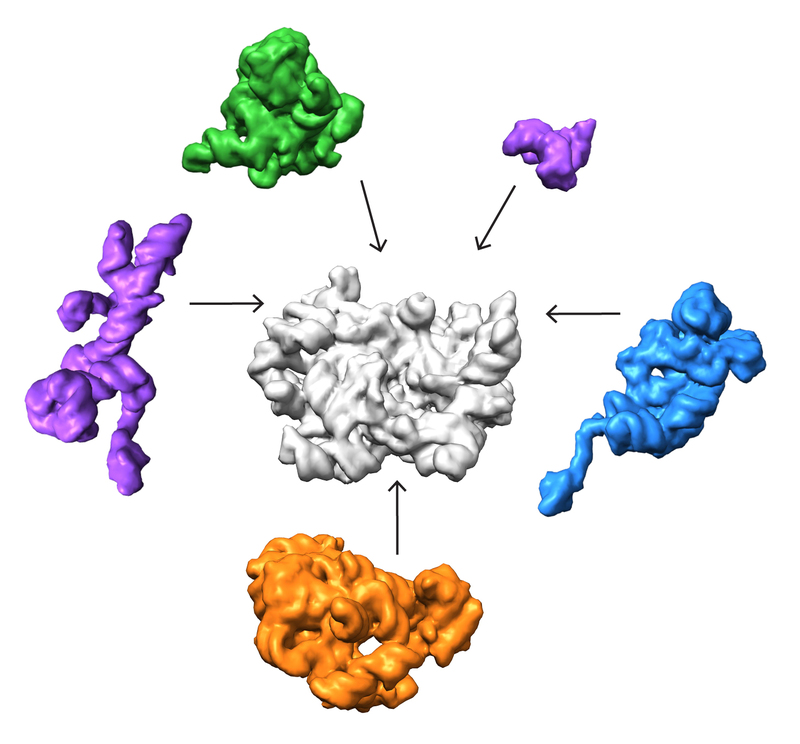 A collaboration led by the Salk Institute for Biological Studies and The Scripps Research Institute in La Jolla, California, deployed a cutting-edge imaging method called single-particle cryo-electron microscopy (cryo-EM) and accompanying analysis tools to decipher some of the key steps for how ribosomes are assembled, a first step in understanding their roles in health and disease. The results are published online December 1, 2016, in the journal Cell. In the past few years, advances in cryo-EM have allowed scientists to image single particles with resolution comparable to that of traditional X-ray methods. But in single-particle cryo-EM, proteins (the “particles”) are flash-frozen and imaged using streams of electrons, meaning the molecules don’t need to be crystallized and can retain much of their native structure. Although cryo-EM has been around for a while, new cameras are making it easier to capture proteins at high resolution before the electron spray zaps them. 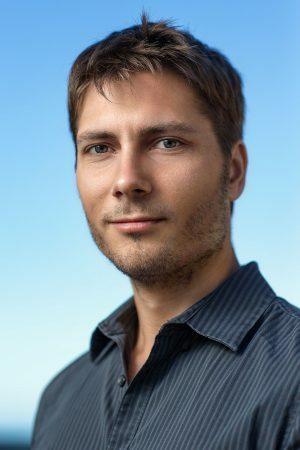 Lyumkis’s group then used high-end cryo-EM to image and analyze these stalled structures, which had not been attempted for such a mix of diverse forms of a particular molecule. 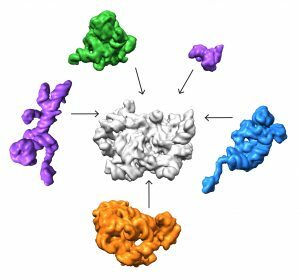 A collaboration led by the Salk Institute and The Scripps Research Institute in La Jolla, California, deployed a cutting-edge imaging method called single-particle cryo-electron microscopy (cryo-EM) and accompanying analysis tools to decipher some of the key steps for how ribosomes are assembled, a first step in understanding their roles in health and disease. The team’s analysis suggests that ribosomes can take several different routes for assembly, which is important to ensure that the process is efficient and can withstand a variety of cell stresses, according to Williamson. “If you imagine an assembly line where every step has to happen in sequential order, and there is a problem at one of those steps, everything grinds to a halt,” he says. “If there are parallel pathways, then assembly can proceed through other channels until the problem is resolved. Other authors on the study are Joseph H. Davis of The Scripps Research Institute; and Yong Zi Tan, Bridget Carragher and Clinton Potter of Columbia University and the New York Structural Biology Center. The research was supported by the Jane Coffin Child’s Foundation; the National Institute of Aging; The Leona M. and Harry B. Helmsley Charitable Trust; the National Institute of General Medical Sciences; the Simons Foundation; and the Agency for Science, Technology and Research Singapore.